S& L Global Company Inc. is a Securities and Exchange Commission (SEC)-registered company. It has been in the busine of international trading since October 2004. 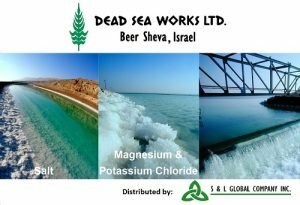 The company represents Israel’s Dead Sea Works and Salt of the Earth in the Philippines. It mainly caters to carrageenan manufacturers, food & pharmaceutical, animal feed and agriculture industries. 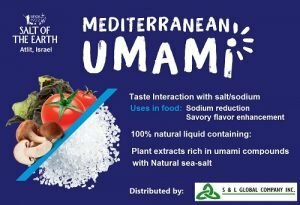 Currently, it’s new product line, Mediterranean Umami, an ingredient from tomato concentrate which helps reduce salt content in foods by upto 45% manufactured by Salt of the Earth in Israel, is being launched in Philippine food manufacturing industries. The Israel Chamber of Commerce of the Philippines (ICCP) member also sells patented products from the Philippines through an exclusive distributor in the US. It offers products like glucose, salt from Israel, starches and condiments, food additives, food packaging and processing equipment. The company has diversified into bulk exporting of Philippine crops, including black pepper, ginger, moringa, and coffee, as raw materials and ingredients for the international market or for reprocessing and repacking for consumer needs. The company, in collaboration with non-government organizations in the Philippines and Europe, has participated in disaster preparedness, food safety, education and e-learning courses. This is part of its corporate social responsibility program. If you are interested in reaching out to the company, you may call them at (+632) 8538005 or (+632) 8542454, or send an e-mail to [email protected]. The company’s main office is at 9759 Felicidad St., Gat-Mendoza Cpd., Paranaque City, Metro Manila, Philippines 1700.